Today we are going to start a new case study example on YOU CANalytics. In this case study example, we will examine different facets of marketing analytics and customer relationship management (CRM). We will use the example of online retail to explore more about marketing analytics – an area of huge interest. However, the learning from this case could be extended to many other industries. As a part of this series for marketing analytics, we will talk about identifying opportunities among the existing customer base for cross/up sell. We will design experiments and A/B testing schemes to learn about managing campaigns. We will also explore other scientific ways to learn more about the customer for organizations to strengthen their business relationship with their customer base. But before we start we need to understand a bit more about the science of..
OK, in this section of the article I have a task for you. You want people to cut down on their electricity consumption by switching from air conditioners to ceiling fans. I have listed down a set of reasons you could offer to them through advertisements. Arrange the following reasons in order of their influence on most people to cut down on energy consumption. Have you taken a stab at the task? Then read ahead! ‘Protect Environment’ was ranked on the top followed by ‘Benefit to Society‘ and ‘Save Money‘. This leaves ‘Follow Others‘ at the bottom of the list to influence people to reduce their electricity consumption. In a survey, you capture the order of responders’ aspirations. The results from the survey carried out by Dr. Cialdini make sense since who wants to follow the herd. We are all free thinking creatures, aren’t we? But the question is whether people behave the way they think. To test whether people’s money is where their mouth is, Dr. Cialdini did a set of experiments. He placed a message on the doorknobs of people’s houses with either one of the four reasons to save electricity. Then he measured the electricity consumption patterns for all these people. The results will surprise you for sure. The group that received ‘Follow others‘ message outperforms every other group by a huge and significant margin for reduced consumption of electricity. The roots for the success of ‘Follow Others‘ strategy are in evolution. From the evolutionary standpoint, for species ‘Follow Others‘ is a far more superior strategy for survival than any other. Imagine a prehistoric human in a dilemma to choose one of the two roads in front of him: one the road well traveled and safe, and other with little information about it. There is high risk on the road less traveled, and risk taking is an aberrant behavior from the evolutionary point of view. If you still have doubts about the results from Dr. Cialdini’s research and the evolutionary argument, try to fight the temptation of looking in the same direction where a group of people staring at some incident on the street. 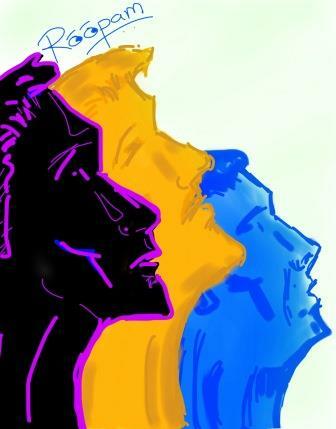 You like it or not but humans involuntarily behave like other similar humans around them. We all follow an involuntary pattern and this pattern detection is precisely the idea behind marketing analytics. If your next door neighbor buys a new car you are immediately tempted to buy a new car. You may not believe how we live our lives around these constant involuntary temptations and mostly succumb to them. 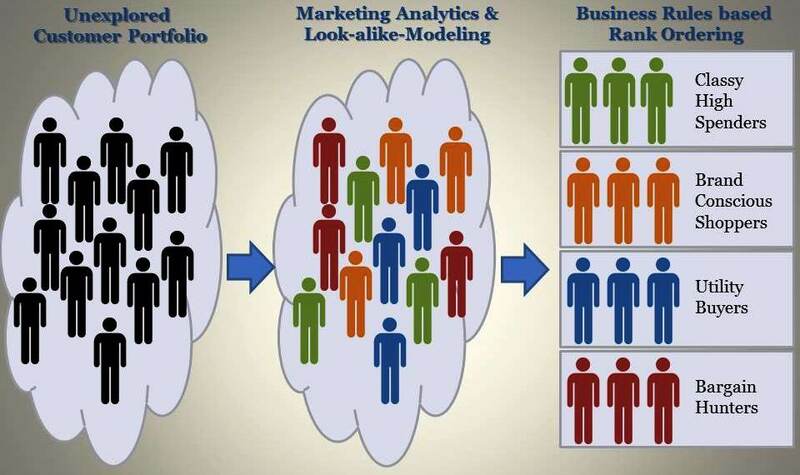 The task for marketing analytics is to identify groups of people similar in their attributes to learn more about them. This method is also referred to as look-alike-modeling. This helps businesses to devise a sound marketing strategy for different groups of people based on their needs and consumption pattern. To get a quick feel for workings of marketing analytics, consider the following schematic. You start with the unexplored customer portfolio and then using data mining and advanced statistical tools try to identify hidden but interesting patterns in customer spends behavior. Eventually, you superimpose business knowledge and rules on top of this classified portfolio to formulate sound business & marketing strategy for business growth. We will get a better understanding of the above process in the following case study. You have recently joined in as the chief analytics officer & business strategy head at an online shopping store called DresSMart Inc. that specializes in apparel and clothing. One day you had the chief marketing officer of the company come rushing to you office looking unusually worried . The board of directors has given him hefty targets for sales and slashed his marketing budgets into half at the same time. You immediately identify that you are dealing with a common business problem of improving business revenue with reduced cost. You have also realized that this is a great opportunity for you to establish analytics practices in the company since there is a quick opportunity for you to improve the P&L (income statement). Additionally, the CMO informed you that last year they had carried out marketing campaigns with different offers on the product catalog. A direct mailing product catalog was sent to some hundred thousand customers from the base of over a couple of million customers last year with the response rate of 4.2%. The direct mailers were later followed up with SMS and email messaging. The objective essentially is to maximize cumulative value generated by customers while minimizing total mailer cost. You explained that the analysis will have an impact on the variable component of the campaign i.e. you will reach out to the right set of customers and generate maximum value. Additional there is an intangible benefit of this exercise i.e. reduced customer dissatisfaction from unsolicited offers. The CMO left you as a much less worried man than when he entered your office. However, you know that you had your work cut out, and you need to think of the right approach to solve this problem. You are up for the challenge! Coming back to incentives and influence, you have enough incentives to work on the above problem since it will establish you and your practice in the company. Additionally, you will also influence the right people in the company since you will improve the income statement of the company. The primary task while initiating an analytics project is to clearly define the end goals/objectives of the exercise. The projects that influence the financials of a company goes a long way. Hence it is a best practice to link the end goals/objectives of your projects to the financial influence. See you soon with the next part of this case study example. Hi Roopam, waiting next parts , how many 2 or 3 atleast I guess? 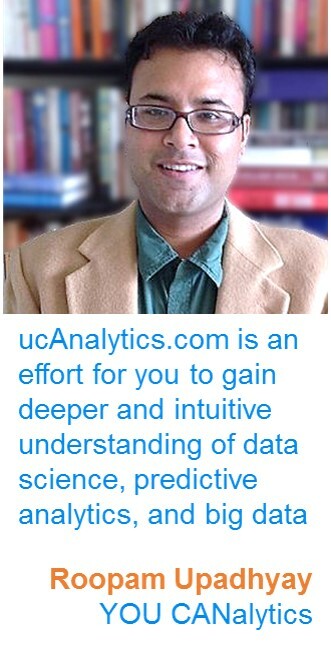 Hello Chetan, Thanks for keeping up with all the articles on YOU CANalytics! This will be a much longer series, it may run for 10 parts or more. Hope you will enjoy this one. Yes Roopam ,every bit , but pls hurry on the next few ..all for good learnings ! Thanks Sahil, will try my best to post the articles on a regular weekly basis. I know I have been tardy while posting articles because of my crazy busy schedule. Thanks for keeping up with the posts, really appreciate that! Can you please provide us with the at least the relevant datasets or if possible codes for us to practice and see the results . Worth a read, every bit of it…. pls touch on koyck modelling and hierarchical model..too..if possible with some dataset or code..i searched the net but could not find any good article on these two. Hi Roopam – Can you pls provide the link to the dataset being used in this retail case study?